BEFORE: Media Criticism is yet again the host of the next film in the movie marathon, The Matrix. Continuing with the movies-I’ve-already-seen trend, I have in fact seen the whole trilogy before. However, I remember hardly anything from the second and third entries and with my class showing the original, I thought I’d make an event and watch the whole trilogy again. AFTER: Once again, I took the red pill and saw just how far the rabbit hole goes. The Matrix is everything I remembered it was and has lived up to the multiple viewings over the years. I think the biggest strength of The Matrix is it’s use of technology. Back in 1999 when the film was released it was truly revolutionary in terms of visual effects, most notably the bullet time effect. Looking at the film from that perspective, it’s really mind-blowing how a film not only looks unlike anything ever seen before, but also has a creative story as well. Fast forwarding to today, the look and style of The Matrix still hold up. When I see bullet time today I’m still impressed with the technical accomplishments involved especially knowing now how it was done. But more than just the visual effects used is the technology seen in frame. An advantage of having a “real” world and a “simulated” world is that there can be differing technologies and there can be a modern and futuristic look mixed in to both of them. It has gotten a bit out of date but it has held up surprisingly well and to compare it to another film, has held up much better than the technology in Alien. I mentioned the story in passing above and I’ll expand on that now. 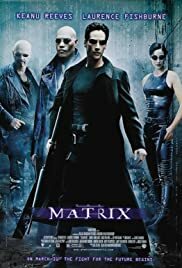 Another strength of the film has always been the unique and detailed world that the Wachowski’s (no longer brothers by the way) created. To think that the reality we are used to is just a simulation and that in our “real” reality we’re slaves to technology run amok is just crazy to think about and they explore that concept in depth multiple times throughout the film. One of my favorite scenes being this conversation between Agent Smith and Morpheus (spoiler warning for said scene). The Matrix is definitely high up on the list of films I’ve seen. The technical and creative accomplishments that Wachowski’s made are outstanding. And while the film has stood up over the years and over repeated viewings for myself, I did notice this time through a slight annoyance with the pacing between the scenes of the real and simulated worlds. It still didn’t detract from the overall entertainment value of The Matrix, but I think I’ve gotten to the point where because I know what is going to happen next, some of the excitement has been taken out. For people who haven’t seen the film thought, it’s should be on your list of films to watch.